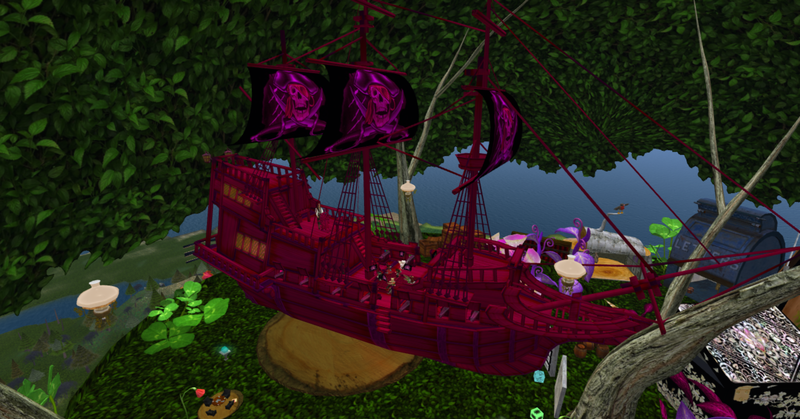 RABID PINK PIRATES CHAAARRTER HERE. RABID PINK PIRATES WELCOMES EBERONE! Absolutely everyone is welcome to join the Rabid Pink Pirates. 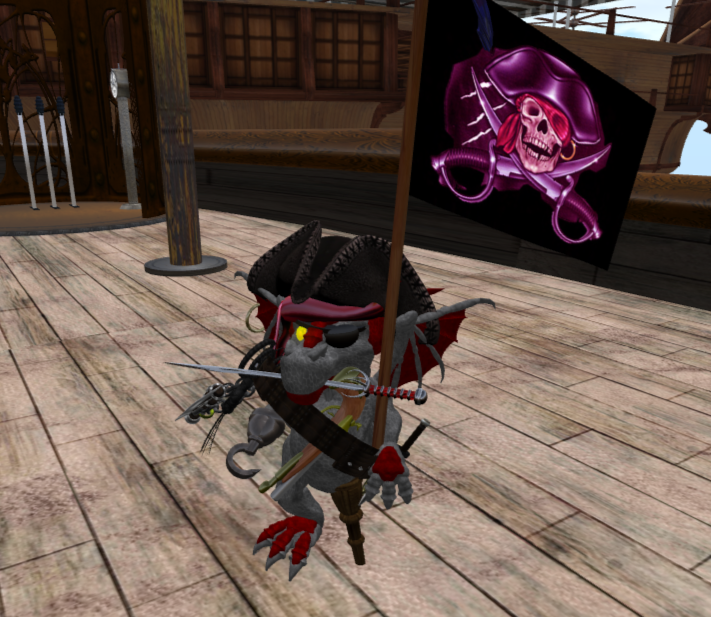 Whether tinies or biggies, dinkies or dwagons or pixies, there is Rabid Pink Pirates of all shapes and sizes. 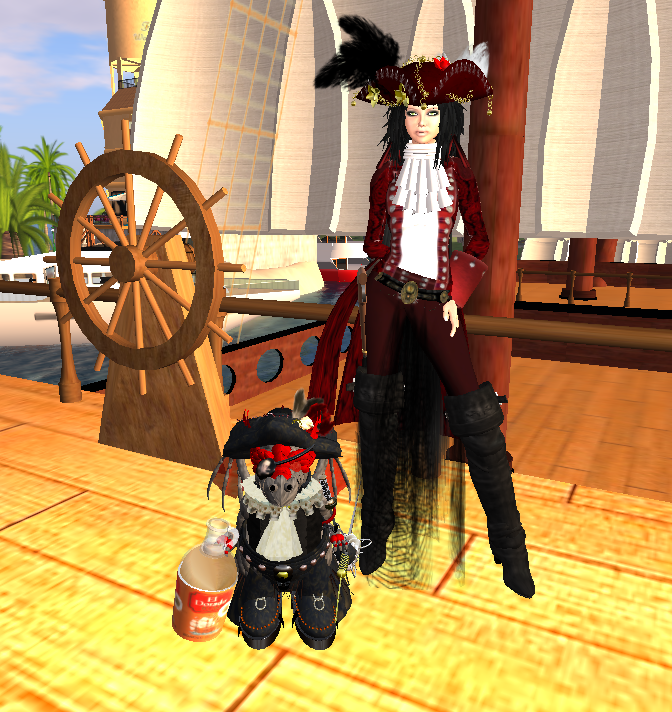 No distinctions, we're all scurvy an' rotten to da crossbones! The group is free to join. Search groups, join, haz fun! WHO IS DA RABID PINK PIRATES? The year is... a long time ago, in a virtual world far, far away. Elf Clan was in its early years, growing and going strong. 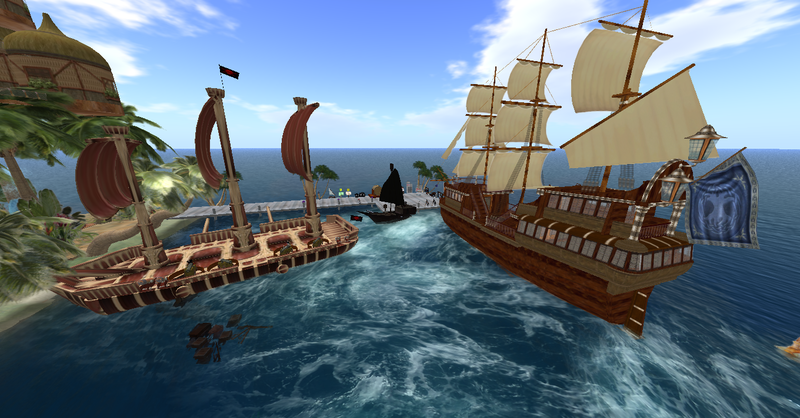 Out of nowhere someone came to Wayfinder Wishbringer, founder of the group, and gave him a surprise gift: a small parcel of land in JESSEE, the well-known infamous battle sim on Second Life, free of charge. The details are long forgotten history, but suffice to say this person owned this land as part of another land deal, had no desire or need for it and felt that Elf Clan might enjoy doing something with it. Jessee was "battle homed" which means that amunition was live, and if one got hit enough times (or by something powerful) it would send them HOME.... from which they would have to port back into Jessee again (a time-consuming task in those days). WHAT CAN YOU DO WITH 24 PRIMS? The Elf Clan tinies got together and decided to create a group. What to call it? 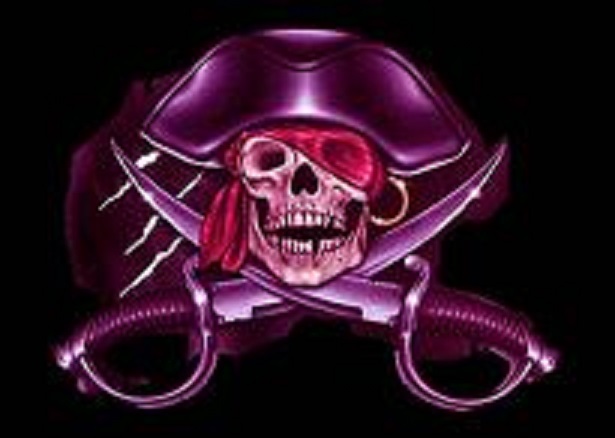 How about RABID PINK PIRATES! Elf Clan already loved pirate parties and Talks Like a Pirate Day was a major event, so let's put all that enthusiasm to good use. A flag was designed-- a fancy skull & crossbones (but pink of course)-- the word put out, and members started coming in. 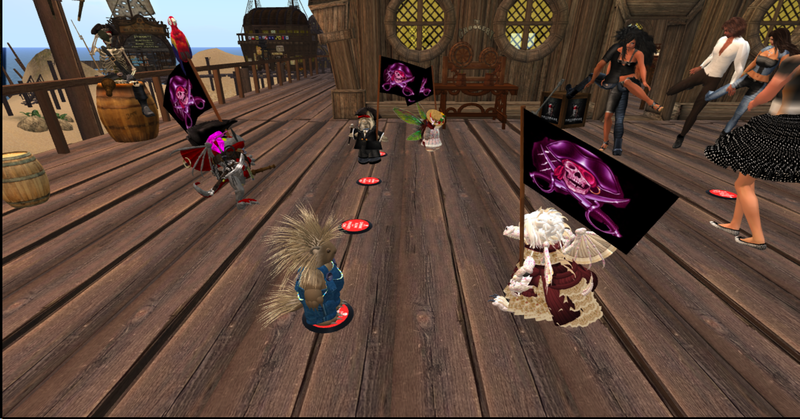 They mostly consisted of tinies, but "biggies" joined too... especially when we transferred to Inworldz! Fortunately for our group, this particular parcel of land was right in the center of Jessee, and the highest point in the sim. This allowed tremendous tactical advantage for the group... if they had some protection. Because the truth is a lone, isolated avatar on Jessee would last as long as whipped cream at a pie fight (which we'll discuss more of in a bit). So Wayfinder built a tiny battle fortress... four floors designed for habitation by tiny terrors. It had slots built into it so things could be shot out of it, but like all good fortresses prevented (for the most part) weapons from entering the fortress. The Rabid Pink Pirates took over the fortress immediately and had many events in which they would cram as many tinies in the fortress as would fit, each armed with some kind of absurd weapon. The favorite was WATERMELON LAUNCHERS, which were long-range, minimal-damage projectile weapons. You can imagine the surprise of seasoned Jessee warriors who were suddenly bombarded by wave after wave of ripe watermelons. Add to that PIE THOWERS, which left splatters of whipped cream wherever they hit. WAFFLE TOASTERS were legal devices, as was anything else the Rabid Pink Pirates could come up with. And since the fortress had been well-built (and extremely simplified), it was difficult for the standard battlers to figure out how to infiltrate it. Before long the Rabid Pink Pirates had a reputation on Jessee as a force to reckoned with. For although watermelons and pies may not carry the punch of some of the highly-lethal weapons carried by the everyday Jessee warrior, get hit by enough of them and it does some damage. More than one battle-hardened soldier was sent home by one watermelon too many. 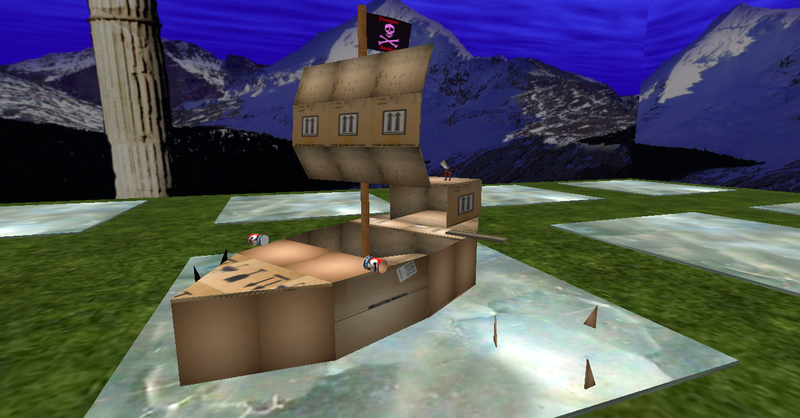 People could tell by the congregated green dots on the Mini Map that the Rabid Pink Pirates were there and loaded for bear... and that for the next hour or two, tiny mayhem would rain down upon the region from the highest vantage point in the sim. Some warriors congratulated us on our well-conceived strategy and invited us to visit their lairs and dugouts. They had some nice places there-- ranging from trenches to dugouts to underground party zones. It was amazing the variety of places on Jessee. The fortress was inhabited mostly by tinies in those days (not a lot of room inside). For quite some time the Rabid Pink Pirates enjoyed some notariety as one of the primary (not to mention most hilarious) battle groups on the region. 'Cos when you hits someone wif a watermelon, you gotta shout a jeer at da accomplishment. Dat's just how it done! "YOU BEEN MELONED BY A WABBIT! BWAAHAHHAAHAA..." Since we were in the very center, the shouted laughter and tiny taunts could be heard all over the region. Eventually the person who owned the land shut down his holdings on SL (as did many people) and we lost our land on Jessee. But while we had it, the RABID PINK PIRATES made the most of it... and enjoyed every minute. 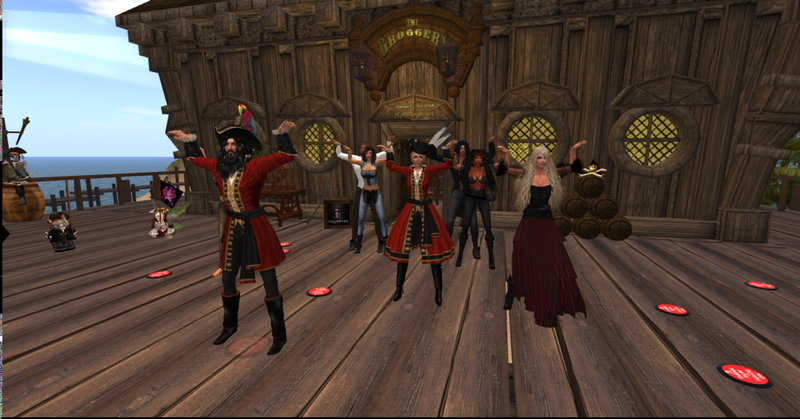 When Elf Clan came to Inworldz the Rabid Pink Pirates came with us. We're not many, but we're ENTHUSIASTIC. Anyone can joins us, regardless of size and shape. MOAR RABID PINK PIRATE FOTOS!!! Snoots, da Scurviest of da Rabid Pink Pirates. 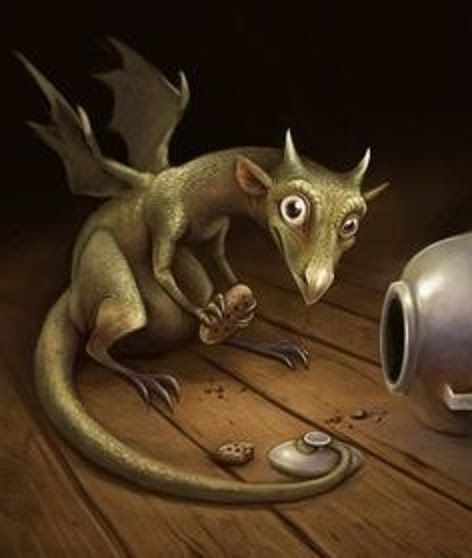 Is rumored to sit on chocolate cakes. Arrrrrrrr. 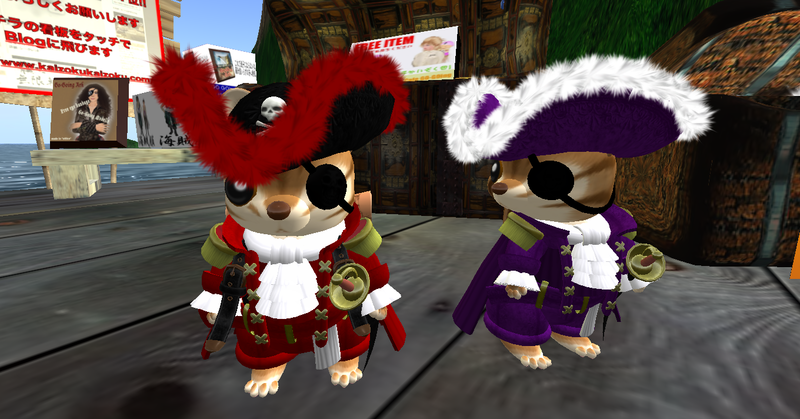 Rabid Pink Pirates come in ALL SIZES! No scurvy distinctions here, we is all scourge of da Seben Seas! Oh noes! We is sinking! Curse da barnacles on our hull! Talk Like a Pirate Day-- BAM! Got 'em!